The headlines yesterday were all about the crack found in a support beam at San Francisco’s new Salesforce (Transbay) Transit Center. 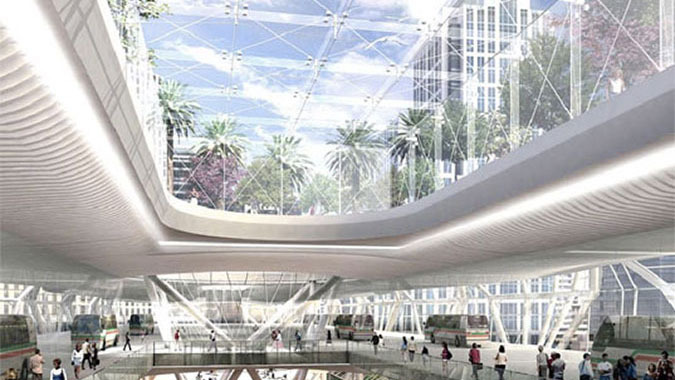 Called the Grand Central of the West, it took almost 10 years to build and cost $2 billion. The crack caused officials to shut down the center. Overnight an additional crack was found. The center is operated by the Transbay Joint Powers Authority, a government agency with representatives from San Francisco, the state and local transit authorities. Public records reveal that the center’s general contractors are Webcor and Obayashi. Thornton Tomasetti is the project’s structural engineer. The center itself is massive and stretches for a couple city blocks. It was designed to accommodate over 100,000 passengers each day. Holding the facility together is a steel skeleton made up of 44 million pounds of steel. The steel was reportedly fabricated in the United States by a Stockton, California company, Herrick Corporation. At this point, no one knows what caused the beams to crack or when the center will reopen. Local media outlets are saying the closure of the center has caused transportation chaos. Is American steel better than foreign steel? Not necessarily. Quality steel can be manufactured anywhere in the world. Certain countries, however, have a reputation for forging better steel products. Those countries include the United States, Germany and Japan. Federal law requires construction and transportation projects financed with federal dollars to use U.S. steel in construction projects. The original Buy American Act was passed in 1933 during the Great Depression. Its intent was simply to protect American manufacturing jobs. Several more Buy American laws have been passed since then including the Surface Transportation Act in 1982. That law has as a secondary purpose insuring that steel used in bridges and transportation projects is high quality. The biggest producer of steel in the world is China. Russia, Turkey and India rank high on the list too. Steel produced from China (and most other countries) is far less expensive. Some contractors and suppliers cut corners and substitute in cheaper foreign steel on construction projects. They charge for U.S. steel but use a cheaper substitute and pocket the difference. In fact, Chinese steel is so inexpensive that the San Francisco Oakland Bay Bridge turned away tax dollars simply so they could use Chines steel. Today they are paying the price. Some cables and underwater structural steel are corroding so badly that it must be replaced resulting in possible $1 billion cost overruns. We aren’t suggesting that all foreign steel is low grade. Not at all. But by saving a few bucks, chances are greater that the steel you purchase is of a lesser quality. And when you buy from a company thousands of miles away in country not known for its openness, it’s hard to know what you are getting. It doesn’t take a rocket scientist to figure out the quality and engineering differences between a Ford Pinto and a Chevy Corvette. But what about a one foot section of a steel beam made in Turkey and one made in the US? For that you need an electron microscope. We are not accusing Herrick of swapping out American steel for a cheap substitute. Nor are we making any accusations against Webcor and Obayashi. The cracks in the beams at the Salesforce Transit Center could be a design defect. They could have been caused because the foundation is unstable. Maybe they were installed incorrectly. Or maybe Herrick’s suppliers weren’t so honest. We believe there are bridges, highways and government buildings across the United States built with subpar steel. And we are looking to identify those projects. The Buy American and other US preference laws do not have whistleblower reward provisions but the federal False Claims Act does. Inside knowledge of companies violating federal and state preference laws may entitle you to a large cash reward. Companies that falsely certify compliance with Buy American laws are subject to triple damages and large fines if the project receives federal funds. And the whistleblower reporting these violations? They can collect between 15% and 30% of whatever the government collects from the wrongdoer. We are grateful that the structural cracks were discovered before there was extensive property damage and before anyone was injured. Falsely using foreign steel in building projects, however, is like playing Russian Roulette. When engineers and architects don’t know the quality of steel they are working with, tragedy can result. And no matter what, taxpayers are hurt. Who foots the bill for repairs of the Salesforce Transit Center? Local taxpayers and riders using rail and bus service. This post mostly discusses the use of foreign steel in transportation and government building projects. Let’s assume the steel supplied by Herrick was forged in the United States. If a manufacturer knowingly supplies a substandard product, they also can be prosecuted under the False Claims Act. Somebody is responsible for the mess at the Salesforce Transit Center. We are certainly not pointing fingers at Herrick or the two general contractors. We are looking for insiders with information about poor quality or foreign steel. If you have inside information, call us. Under the False Claims Act, going to the press or reporting to an agency such as the Transbay Joint Powers Authority doesn’t get you an award. You must dot the i’s and cross the t’s to qualify for an award. And that means filing a sealed court complaint. All information is protected by the attorney-client privilege and kept confidential. We only get paid for our services if we collect money on your behalf. All services provided using local counsel where required.